Women and children affected by violence have increased access to services and support in Tarawa with the opening of the new Kiribati Women and Children Support Centre (KWCSC). On Wednesday 31st January, the Australian High Commissioner to Kiribati, Mr Bruce Cowled, officially opened the Centre, followed by the ribbon cutting and unveiling of the Centre’s billboard by a senior representative of the Kiribati Ministry of Women, Youth and Social Affairs. The Centre has been developed with support from the Kiribati Family Health Association and funded by the Australian Government’s aid program initiative, Pacific Women Shaping Pacific Development (Pacific Women), including funding for technical support and training provided by UN Women and the Fiji Women’s Crisis Centre. Services offered include free confidential counselling for women and children (Te maroro), legal information (Ataakin te tua), case management (Buokam inanon am kanganga), community awareness (Reirei ao maroro ma te botannaomata) and other services. ‘I congratulate the Kiribati staff who will be operating the Centre from today. Their roles will be very challenging but with good leadership, capacity building and strong teamwork the Centre will deliver much needed services.’ Mr. Cowled said at the official opening on Wednesday. 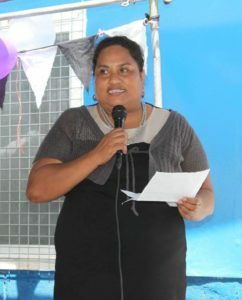 Centre Coordinator, Teretia Tokam, explained that Kiribati has one of the Pacific region’s highest domestic violence prevalence rates, according to the 2010 Kiribati Family Health and Support Study. ‘The goal is to better support women and children who are affected by violence. We want to ensure the Centre provides quality services while ensuring women and children feel safe and confident to come to us and seek support,’ Ms Tokam said. ‘Today’s launch has only been made possible because of strong collaborations across many government, non-government, civil society, development and other partners all committed to reducing gender-based violence and child abuse cases at the national, regional and global levels,’ she said at the opening. Kiribati Country Programme Coordinator for UN Women’s Multi-Country Office (MCO) based in Fiji, Katarina Tofinga, said that UN Women will continue its support, such as with further training for counselling staff during the initial two weeks of the Centre’s operations. ‘Every woman and girl has the right to live her life without the threat of violence, and we’re proud to support KWCSC and other agencies across the Pacific committed to ending violence against women and children,’ Ms Tofinga said. Women and children seeking assistance can visit the Centre in Bairiki in Tarawa, or phone its 191 Helpline number or 750-21000 landline. The Centre has trained counsellors available and ready to assist.